Selby Shotokan Karate Club are working in partnership with the "Active" programme of Selby District and North Yorkshire Sport to bring karate to Barlby Community (Hilltop) and Barlby Bridge Primary schools starting in April. We will be running hour long sessions, over a 10 week programme at both schools to increase the availability of access to sport for children. There will also be an exit strategy of assisted places at our club to any students that wish to continue with Karate. Sensei Andy and Rebecca will be undertaking the coaching, we wish them all the best in this exciting opportunity of bringing our martial art into schools. The video tutorials are slowly growing in number there is currently 23 posts to view, keep popping back to see what is new in this library of karate at its best. Just returned from the Army Martial Arts Association competition in Aldershot at the Army's school of physical education. I sometimes wonder why I still put myself through it at my age and mileage? The Army team is going to train and compete in Japan in May and were there in force. There were 8 dan grades for Kumite and it was decided to split into groups and to run a round robin style event. Every one had four fights and then assessed on points there was a fight for 3rd place and then for 1st and 2nd. To be honest I don't think the draw made a lot of difference because the standard is very high and getting better all the time. However I was on first with the Army and Tri-services karateka Brian Hall. For our IJKA friends Brian is built a bit like Tamas from Hungary but younger and faster. To WKF rules the fight was stopped at 8-0. I was happy to finish in one piece. Above : WO2 Brian Hall- 4th Dan - "looms large"
My next fight was with Mo Morris a 3rd Dan PTI, although I lost against Mo I did manage to score. My third fight was with Joe (Sorry I Can't remember the surname) much more of a veterans fight but Joe brings a wealth of Karate experience to the Army team and to the mat. Wherever I went I seemed to be on the end of his Gyaku Zuki. My last fight was against a young 19 year old dan grade Chris who trains with Dave Ginger I believe. I tried a technique that Sensei Keith showed us last week. A Gyaku Zuki, block their Gyaku Zuki and step in Oi Zuki Jodan. The technique worked really well and I believe reasonably controlled however Chris was a little dazed and stumbling about, Dave decided that Chis had had enough and withdrew his lad. I thought the referees decision to disqualify me and award the fight to Chris a little harsh, but I was happy to accept the decision without question. I never enter with the illusion that I will win but I enter with the theory that my karate can only improve if I train and compete against strong competition. Many thanks to all for the opportunity to be totally out classed (again), and I look forward to next year. 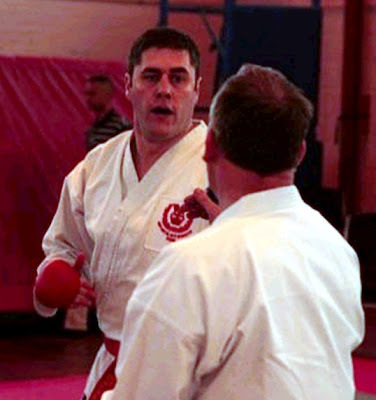 Many congratulations to Sensei Mike as he commences his journey on his 7th decade today! We have survived 3 days training with Kagawa Shihan and a few hundred miles driving up and down the countries motorways, but the 12 hours driving was well worth it. Today's kata for Shodan and below were Bassai Dai and Empi. It was Kagawa Sensei who first taught me Empi when he travelled with Asai Sensei to the Crawley course a few years ago. Last time I was trying to learn the moves as a Purple belt I think. Today I could focus on what Sensei was explaining about the detail. Unfortunately despite Hans Sensei encouragement to sneak into the Nidan and above training we missed out on Sensei teaching Kanku Sho, a Kata Simon and myself have been practising for the last few weeks. I am sure that Sensei Keith will be able to pass on Sensei's "top tips" over the coming weeks. I am sure Simon will be too modest to mention , so I will. Sensei got Simon to demonstrate the jump in Empi and after a couple of minor corrections and a few more jumps stated "good jump eh" compliment indeed! Many thanks to the JKS for inviting us. I still have a little work to do before I can kick like Sensei Hans. Following Sensei Hans warm ups and stretches Kagawa Shihan helped us by showing us some really good leg strengthening exercise (look forward to them). Friday was spent on mainly Kihon, stepping forward, Gedan Bari, Age Uke, Soto Uke etc etc. After 10 years training I still have so much to learn. Today's training was split Shodan and below and Nidan and above. Sensei Keith was called back by Sensei Scott when he tried a sneaky exit from the dojo. I was surprised when Sensei Keith continued on for a third session to complete nearly 5 hours of training in one day -respect, and there is still tomorrow to go! The two kata I am trying to work on at the moment are Jion and Bassai Sho. I was particularly pleased when Kagawa Shihan choose to teach Jion today. Many thanks to Robert Graham for posting some photos on facebook and Hans Sensei for tagging me, Osu! Karate Tutorials is still under construction but you can take a sneaky look if you like by clicking on the button below. There are currently about 15 1st class videos posted from some of the best karateka around the world. Claire our Welfare Officer will be taking a few months off to take care of her own welfare. When she graded last week she was not aware that she was five months pregnant! We wish you all the best from the whole club, I will order an extra small Gi for four months time.